We stopped by The Rochester Hotel on a cold and drizzly Tuesday night, expecting...well, expecting a ghost town to be frank. Ten years ago, The Rochey was big with student crowds—you could rely on it for cheap pints, sticky floors and a ping pong table. That was about it. Things got busy on Uni Nights and weekends, but you were always there for the sizzle, never the steak. Random Tuesday night and the place is pumping. There’s a big fire crackling away, squishy mismatched vintage couches, stuffed with chatty locals. There’s old couples up at the bar, digital nomads doing freelance work on MacBooks and tattooed twenty-somethings swigging craft beer and talking politics. It’s like some scientist distilled the essence of Fitzroy in a lab. ...because The Rochey isn’t doing Miss Katie’s crab claws anymore (she moved into permanent digs on Smith St), and it’s not doing pub grub. It’s now serving up some of the best damn southern Indian food you’ll find anywhere in Melbourne. Just really, really, delicious, you’ve-gotta-go-here, head-sweating, spice-kicking good food. Mischa Tropp has already stamped his name on the Melbourne scene. He’s run kitchen takeovers at Tomboy, Host and Etta. But this one’s different, or at least we hope so—this time he’s here to stay. 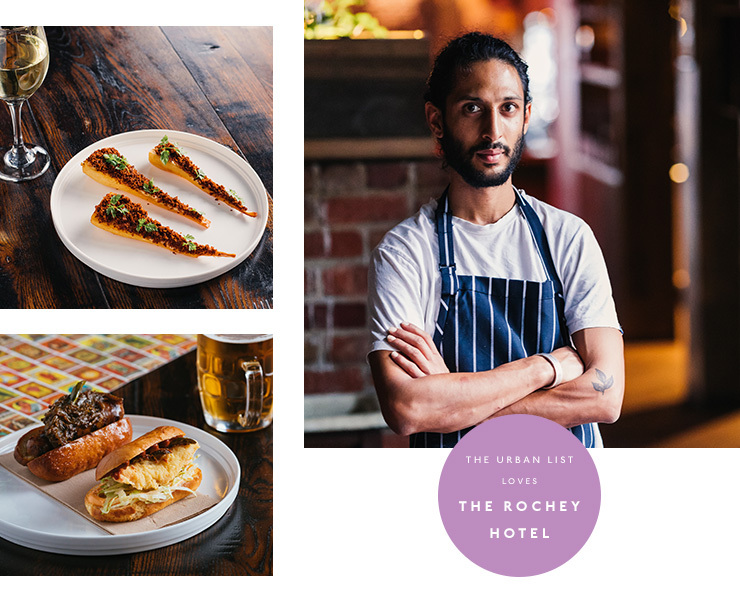 The new Rochey menu is a result of careful study, Mischa’s regional expertise and “f*ck it, let’s see if they’ll eat this” experimentation. It’s Kerala X Melbourne. Southern Indian street food meets Fitzroy pub classics (the hot chips slathered in curry sauce were Stu’s idea—he’s Mancunian). We started with the confit parsnips with shiso and a Kashmiri chilli crumb, plus a side of pickled chillies and the Goan chorizo sliders with onion masala. These things might singlehandedly rescue the humble Slider’s reputation—we could have eaten about 17. Next, it was on to mains. Spicy beef Thali curry and the flakiest, buttery-est parota bread you’ve ever eaten in your life. Nearly everything in Kerala is spicy, but Mischa has dialled down the chilli-factor for local tastes. The fish curry is the only thing on the menu that might singe your eyebrows off, and it’s proved the most popular dish of all. We’re not exactly chilli heroes at the best of times, and the beef was plenty spicy for your average mouth. Right on the edge of pain, your nose starts to run and eyes begin to water, but damn if you’re not using your parota to mop up every last drop. If you’re worried about the spice factor, we got a cooling side of Pulishari—green papaya in curd with cumin and green chilli gravy. Was a nice antidote when the flames got too much to bear. One last tip? Whatever you do, don’t leave without trying Mischa’s Roasted Banana dessert. Whenever a restaurant has just one dessert on the menu, you know it’s going to send pleasure-tingles all the way down your spine, and this one didn’t disappoint: gooey, caramelised banana, served in a metal bowl with homemade salted caramel ice cream and sundried coconut. After one spoonful we mentally added it to our list of Best Things We Ate In 2018. The Rochey’s drinks menu has been given a kick up the arse too. You can still get Rochey Lager on tap, but there’s some interesting independent labels now pouring (the Temple Okinawa Sour works surprisingly well against the curries). Vino lovers? You can tuck into a tight little menu of local producers, and there’s even a special range of ‘Fancy G&Ts’ (try the Autumn Bathtub—Starward gin with star anise, tonic and orange). TBH we could keep gushing about this place for weeks. But mostly we just want to go back for one more mouthful. The Rochey is dead, people. Long live The Rochey. Want to learn more about the new-look Rochester Hotel? Check out our Directory page.